The month of May isn’t just for fitness and sports. This month is also National Osteoporosis Month. While you are being physically active it is just as important to be aware of your bone structure. Making sure your bones are healthy and strong helps to prevent fragility fractures and brittle bones. To celebrate this month, we’ve put together some key facts about Osteoporosis and ways you can improve your bone health. Osteoporosis is a serious condition where your bones become brittle and weak. To combat this, it is good to have a healthy diet. Specifically, a diet that’s great for bone health is rich in fruits, vegetables, calcium and vitamin D. These nutrients will build peak bone mass, so you can lead a healthier lifestyle. By drinking milk and orange juice as well as eating right you can easily take steps to prevent Osteoporosis. Along with a healthy diet, it is also great to exercise and stay active to prevent Osteoporosis. For stronger bones it is important to do weight-bearing and muscle strengthening exercises. Weight-bearing exercises are a kind of exercise that has the person work against gravity. This includes but is not limited to weight training, climbing, jogging as well as dancing. Doing something as simple as jumping jacks will help your bones stay strong and sturdy. Osteoporosis is a bone condition that affects many people. With a healthy diet and exercise you can take steps to improve and maintain your bone health throughout your life. Before changing your diet or starting any new exercises, it’s best to talk with your doctor or specialist to see what is best for you. 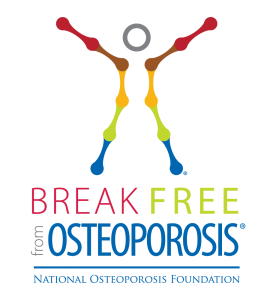 For more information on National Osteoporosis month, click here.